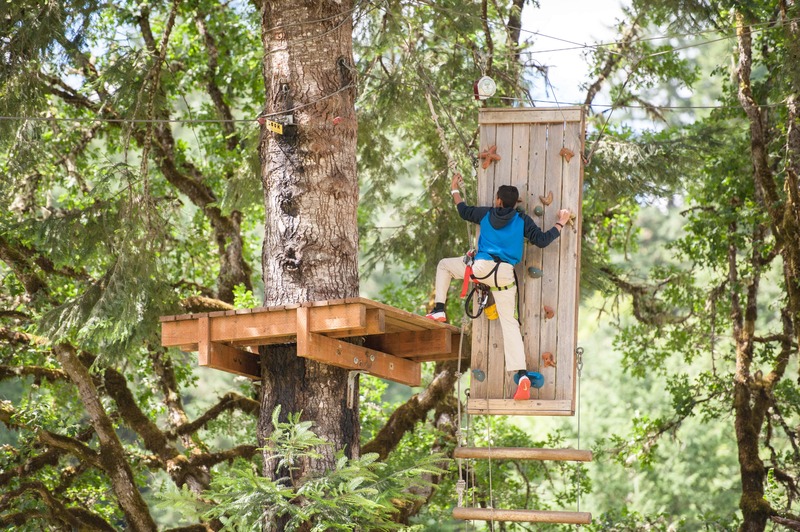 Tree to Tree Adventure Park in Gaston, Oregon, offers a variety of outdoor activities for Portland-area thrill seekers. These include a wide range of challenging aerial obstacles suitable for various ages and skill levels. Fuel your adrenaline with our high ropes course activities that take you high up into the trees and test endurance, balance and dexterity. Unlike traditional high ropes courses, your adventure at Tree to Tree will be self-guided. Our highly trained guides will be watching from the ground to assist you if you need a tip on how to get through a particular obstacle or element. Tree To Tree Adventure Park provides high ropes course activities that are both fun and stimulating. You'll also feel a sense of accomplishment like no other: while other high ropes courses are developed specifically for teams, our courses are designed to provide you with unique challenges for you to take on by yourself. Challenge yourself on our six aerial obstacle courses that present more than 60 formidable obstacles combined. Zoom across 14 interspersed zip lines, climb ladders, perform Tarzan-like swings and walk across wobbly bridges, tightropes and balance beams. Our courses start easier and lower to the ground and gradually get harder and higher. This is a great activity to do with a group of friends who can encourage each person as they individually tackle obstacles on our courses. Having fun is great, but safety is our number-one priority. Although you’re flying solo, our expertly trained guides are always nearby to offer assistance, and all course areas require you to wear a safety harness. Also, accessibility to certain paths throughout the courses is limited based on age and confidence level. Before going up into the trees, our guides teach you about the courses and your safety gear with training orientation, and you must complete a practice course situated close to ground level to ensure you’re comfortable using the equipment. We'll help you gain your confidence and be there to answer any and all of your questions. Adventure Village is a tree fort adventure playground for little monkeys or children ages 2 to 8. Monkey Grove is a grove of rock climbing trees great for monkeying around and challenging yourself to reach new heights. Tree Top Plunge allows you to take a leap of faith from 65 feet in the air. Tandem Racing Zip lines let you race your buddies and may the best racer win. Zipline Canopy Tour, reservations are required for this activity. If you’re ready to soar among the trees in your own high ropes course adventure or any of our other aerial adventures you can make reservations online using the “BOOK NOW” link at the top of the page. Contact us at (503) 357-0109 with any questions. Reservations are available on a first-come, first-served basis. Barring any unsafe weather, we’re open rain or shine, from March to Mid-November.